Sound "As a CD cleaner, Listener Select was quite impressive, removing the mixture of common household substances on my test CD without breaking a sweat." But does it actually improve sound? "The difference was slight but consistent: Cleaning CDs with Listener Select seemed to remove a bit of sonic grunge and distortion from the midrange, so the music sounded clearer and was easier to listen to. But the difference was slight, sometimes even imperceptible." Features "Osage Audios website describes the $29 USD four-ounce bottle of Listener Select optical-disc cleaner as 'a high-purity, high-performance cleaner that is safe and effective for use on all optical discs, including CDs, SACDs, XRCDs, HDCDs, DVDs, and data CDs and DVDs.' It does not contain 'any type of 'conditioner' or 'treatment,' but is only a residue-free cleaner.'" Use "The instructions direct you to 'simply spray enough cleaner onto the disc to cover the surface and wipe with the included high-quality 3M micro-fiber cloth.' Lacking any more detailed instructions, I used two squirts per CD when applying Listener Select. That may have been overkill; I suspect a single squirt would have been sufficient for most tasks." Value "Because Listener Select does a great job cleaning optical-disc surfaces, comes with a large cleaning cloth that works very well, is easy to use, and has the lowest price per ounce in the group of cleaners evaluated, recommending it for cleaning gunk off your discs is a no-brainer." A disc cleaner can do two things: remove foreign substances from CDs, SACDs and DVDs, and make these discs sound better. The first task is obvious, but can a CD cleaner really make a disc sound better? After all, arent new optical discs already squeaky clean? Ive never seen any dirt on a new CD when I opened up the jewel box, and if I did, Id return it. However, while reviewing Walker Audios Ultra Vivid CD cleaner, I discovered that different CD cleaners can indeed make a noticeable improvement in sound, even with brand-new discs. My comparison of several CD cleaners showed that their sonic improvements ranged from mild to significant. Osage Audios website describes the $29 USD four-ounce bottle of Listener Select optical-disc cleaner as "a high-purity, high-performance cleaner that is safe and effective for use on all optical discs, including CDs, SACDs, XRCDs, HDCDs, DVDs, and data CDs and DVDs." It does not contain "any type of 'conditioner' or 'treatment,' but is only a residue-free cleaner." A pump sprayer atop the soft-sided green plastic bottle provides the means to apply the solution to discs. The instructions direct you to "simply spray enough cleaner onto the disc to cover the surface and wipe with the included high-quality 3M micro-fiber cloth." Lacking any more detailed instructions, I used two squirts per CD when applying Listener Select. That may have been overkill; I suspect a single squirt would have been sufficient for most tasks. When I asked Osage Audios president Jim Pendleton how many CDs a bottle of Listener Select would clean, he expected it would be "far more than 1000." To evaluate Listener Selects ability to clean, I took a standard CD (not one of my favorites) and converted it to typical kiddy-playroom condition. Painful though it was to violate years of careful handling practices, I applied several common household substances to the playing surface: hair spray, hand lotion, butter, even pancake syrup. Then I made a half-hearted effort to wipe the mess off with a paper towel, which actually made things worse by smearing the goo across the CD surface. I guess I could have let the disc bake in the sun a few days to harden the goo, but there are limits to the damage I can force myself to inflict on an innocent CD. After all this, the abused CD was completely unplayable -- the player couldnt even read the disc's table of contents. To evaluate whether Listener Select actually improved the sound of CDs, I used the same methodology as outlined in my Walker Audio Ultra Vivid review: I copied a single musical number with which Im extremely familiar, "Folia: Rodrigo Martinez" from Jordi Savalls La Folia, 1490-1701[Alia Vox AFA 9805], onto five blank Verbatim CD-Rs. These were not fancy audiophile-grade CD-Rs, just something I bought at a local variety store. I copied the original piece to my computers hard drive as a .WAV file using Express Rip, a program that reads a CD multiple times to make perfect copies. I then burned the audio CD-Rs using a companion program called Express Burn. After the copies were made, I labeled them and cleaned four of them, each with a different CD-cleaning solution according to its manufacturers instructions. Loudspeakers  Opera Audio Consonance M12, Second ReTHM. Power amplifiers  Atma-Sphere S-30 Mk III and Art Audio PX-25 stereo amps. Preamplifier  Audio Research LS26. Digital  Meridian 508.24 CD player, Oppo DV-970HD universal player. Analog  Linn LP12 turntable, Graham 2.2 tonearm, van den Hul Frog cartridge, Audio Research PH5 phono stage. Interconnects  Crystal Cable CrystalConnect Piccolo, Purist Audio Design Venustas, DNM/Reson TSC, TG Audio High Purity Revised. Accessories  Walker Audio Talisman LP/CD treatment, VPI HW-16.5 record cleaner. I gave my soiled test CD three squirts of Listener Select (possibly overkill), waited 30 seconds for it to dissolve the mess on the discs surface, then wiped the surface dry with the supplied cleaning cloth. The surface looked pristine, and the disc played like new. I was prepared to apply Listener Select a second time, but there was no need -- the grime came off with the first application. So Listener Select passed the disc-cleaning test with flying colors, and this review could end right here. But my curiosity was in overdrive. Would Listener Select make a sonic difference? Wouldn't you wonder about it too? To address this issue, I first selected several CDs Im familiar with and listened to them closely. I then cleaned them with Listener Select and listened again. The difference was slight but consistent: Cleaning CDs with Listener Select seemed to remove a bit of sonic grunge and distortion from the midrange, so the music sounded clearer and was easier to listen to. But the difference was slight, sometimes even imperceptible. There are many CD treatments that are also touted as cleaners, so it was useful to determine how Listener Select stacked up against some of them. Heres the competition for this test: Optrix ($16.99 for a 2-ounce bottle, no cleaning cloth included), Shine-Ola ($24.99 for a 2-ounce bottle and a small microfiber cloth), and MaxxHorns BlueMaxx ($35 for a 4-ounce bottle and a very large microfiber cloth). Except for the Optrix cleaner, I used the cleaning cloth provided by the manufacturer. The Optrix instructions direct you to use soft tissues to apply the cleaner and wipe it off, so I used Kimwipes Delicate Task Wipers, which are soft commercial tissues that dont leave appreciable lint. The Optrix treatment was the most complicated. I had to spray the recorded side twice, spread the cleaner on and wipe it off with two tissues, repeat that treatment, then spray the label side and spread the liquid around but not wipe it off. The other liquids (except Listener Select) required spraying the recorded side with some specified number of squirts, then wipe off the solution and any dirt that may have dissolved with the cloth. BlueMaxx required cleaning the label side as well as the recorded side. One CD-R left uncleaned served as the reference against which to compare the others. For each comparison, I first played the uncleaned CD to establish a reference point, and then played one of the cleaned CDs, scoring on +/-10 scale, where positive numbers indicated an improvement over the uncleaned CD and negative numbers indicated worse sound than the uncleaned CD. I used a score sheet that included the following factors for each CD: clarity/detail, high frequencies, mid frequencies, low frequencies, and soundstage. The actual numbers dont constitute a figure of merit; theres no agreed-upon scale for measuring sound quality. What the scores reveal is the relative ranking in each category. I totaled up the score for each fluid. Heres how they stacked up. These scores show that Listener Select doesnt have much effect on sound, and it doesnt claim to. Its strictly a CD cleaner. Sometimes its best not to affect the sound -- all the other cleaners actually reduced bass impact, but Listener Select didnt. The other cleaners may have slightly improved bass detail, but at the expense of power and impact. Ill take the latter, thank you. By a small margin, BlueMaxx produced the best sound, scoring highest in most categories. I was even impressed by its cleaning cloth; besides being huge, it was noticeably softer than the other cloths. However, after listening to the CDs, I examined each with a 10X magnifier and didnt see any scratches on any of the CDs that cleaned with microfiber cloths. There was a tiny scratch on the Optrix CD; based on its swirling shape, I suspect it was created when I spread the Optrix over the surface with the Kimwipes. The only residue I observed through the magnifier was also on the Optrix-cleaned disc -- a thin film. Perhaps a different cleaning cloth would have improved Optrixs performance, or perhaps I should have used a few more Kimwipes to remove the solution from the disc. All I know is that I followed the manufacturers instructions, and that there was no residue visible to the naked eye when I finished, so Im confident the disc I used was representative of a typical disc cleaned with Optrix. As a CD cleaner, Listener Select was quite impressive, removing the mixture of common household substances on my test CD without breaking a sweat. Thats what its supposed to do; its literature makes it clear that Listener Select is not a CD treatment that somehow improves the sound your digital player extracts. True, just cleaning a CD, even a new one, effects some improvement, and Listener Select made a slight sonic improvement when applied to new or like-new CDs, but probably not enough improvement to justify the cost and effort to apply it. If youre looking for a solution that improves the sound of CDs, even new ones, a CD treatment like Walker Audio Improved Ultra Vivid will do a somewhat better job, but it costs almost three times more and is more laborious to use. Because Listener Select does a great job cleaning optical-disc surfaces, comes with a large cleaning cloth that works very well, is easy to use, and has the lowest price per ounce in the group of cleaners evaluated, recommending it for cleaning gunk off your discs is a no-brainer. 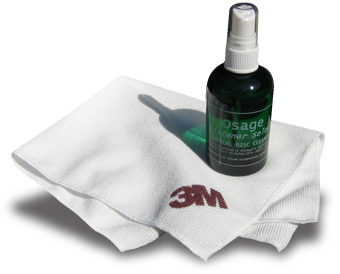 Price: $29 for a four-ounce bottle of cleaner and a 3M microfiber cleaning cloth.